On November 9, 2018 local time, after chairing the second round of the China-US Diplomatic and Security Dialogue in Washington D.C., Member of the Political Bureau of the Central Committee of the Communist Party of China (CPC) and Director of the Office of the Foreign Affairs Commission of the CPC Central Committee Yang Jiechi, attended the press conference together with State Councilor and Minister of National Defense Wei Fenghe, Secretary of State Mike Pompeo of the United States (US), and Secretary of Defense Jim Mattis of the US. Yang Jiechi said that the upcoming meeting between President Xi Jinping and President Donald Trump on the sidelines of the G20 Summit in Argentina will be of great significance. Both China and the US should strengthen communication, cement coordination, and make meticulous preparations to ensure the positive results of this important meeting. Yang Jiechi pointed out that China, the largest developing country, and the US, the largest developed country, are the world’s top two economies. The two countries share broad common interests and huge space for cooperation, and also have divergences and different views in some areas at the same time. 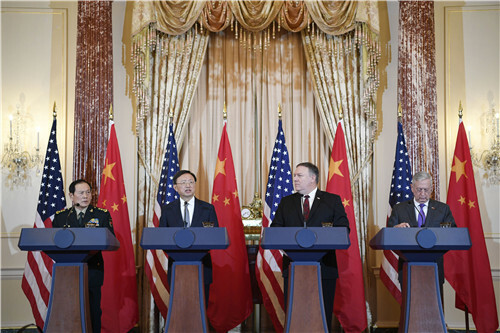 Since the establishment of diplomatic relations nearly 40 years ago, China-US relations have kept on moving forward in general despite some twists and turns. History and reality have proved that cooperation is the only right choice for China and the US, and win-win results would lead to a better future. In the face of the profound and complex international situation, China and the US should, in accordance with the important consensus of the two heads of state, act in the fundamental interests of the people of the two countries and all countries in the world, share mutual respect and mutual benefit and reciprocity, focus on coordination and cooperation, and properly manage divergences, so as to promote the sound, stable and looking-forward development of China-US relations, and bring more sense of satisfaction and fulfillment to the two peoples. Yang Jiechi said that the essence of China-US economic and trade relations lies in mutual benefit and win-win results. The economic and trade issues between the two sides are the results of different economic structures, industrial divisions, as well as development stages, which should be properly resolved through dialogue and consultation. The Chinese side always welcomes dialogue and consultation. It is hoped that the two teams will stick to the guiding spirit of the recent telephone talks between the two heads of state, and step up exchanges and communication on the basis of equality and integrity, so as to push for solutions acceptable to both sides. Wei Fenghe said that military relations between China and the US are an important part of China-US relations. The two militaries share a wide range of common interests and shoulder significant responsibilities in maintaining world peace and security. The peaceful coexistence and cooperation between the two militaries will be beneficial to both countries and the world, whereas conflict and confrontation between the two militaries will be disastrous for both countries and the world. The Chinese military firmly defends China’s national sovereignty, territorial integrity and development interests, and is willing to respect each other’s core interests and major concerns with the US side, strengthen communication, enhance mutual trust, manage divergences, and promote cooperation, so that the relations between both militaries would become a stabilizer of relations between the two countries. 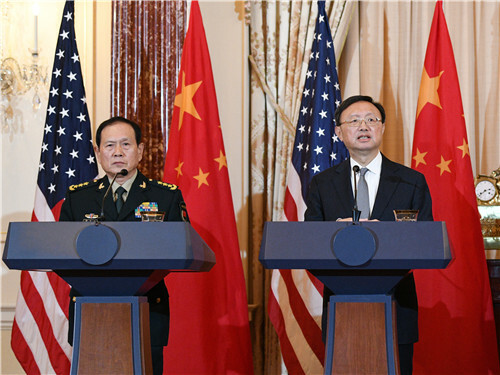 Yang Jiechi and Wei Fenghe respectively answered questions from the journalists on China’s foreign policy, national defense policy, China-US relations, the Taiwan issue, the South China Sea issue, human rights and other issues, and expounded on the Chinese government’s principled stances.